When the PATRIOT Act was passed in the aftermath of the 9/11 terrorist attacks, members of Congress -- Republicans and Democrats alike -- hailed its most sweeping and constitutionally questionable provisions as powerful means to prevent terrorists from once again striking the homeland. And, all too often, when someone disagreed with this narrative and warned of the potential for abuse by federal law enforcement and intelligence agencies, their patriotism was questioned. But Section 213 of the PATRIOT Act, however, isn't being used to investigate terrorism. According to data compiled by the Electronic Frontier Foundation, for example, the authority given under this provision -- through which law enforcement agencies can search the homes or computers of suspects without immediate notification -- has been used more for drug investigations than any other crime. In fact, from fiscal year 2011 through 2013, 81 percent of requested "sneak-and-peek" warrants dealt with drug investigations. Over this same time period, less than 1 percent of "sneak-and-peek" warrants requested were for use in terrorism investigations. Not only does Section 213 have little to do with terrorism investigations, it's being used by law enforcement in alarming frequency. "Law enforcement made 47 sneak-and-peek searches nationwide from September 2001 to April 2003. The 2010 report reveals 3,970 total requests were processed. Within three years that number jumped to 11,129. That's an increase of over 7,000 requests," writes Mark Jaycox of EFF. "Exactly what privacy advocates argued in 2001 is happening: sneak and peak warrants are not just being used in exceptional circumstances—which was their original intent—but as an everyday investigative tool." 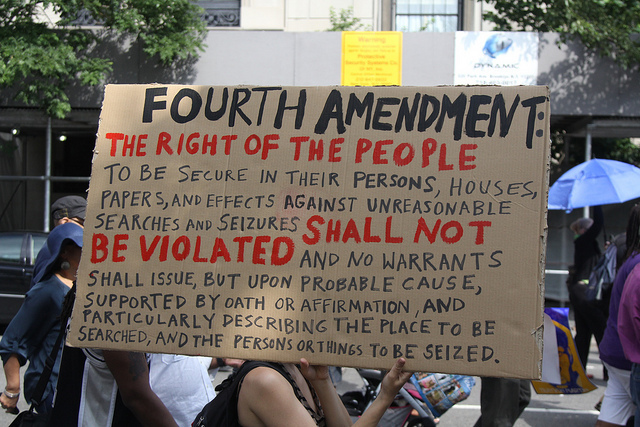 Section 213 -- which, unlike Section 215, isn't subject to reauthorization -- flies in the face of the Fourth Amendment, which states, "The right of the people to be secure in their persons, houses, papers, and effects, against unreasonable searches and seizures, shall not be violated, and no Warrants shall issue, but upon probable cause, supported by Oath or affirmation, and particularly describing the place to be searched, and the persons or things to be seized." Though law enforcement agencies could make the case for delayed notification search before the PATRIOT Act, it was a tool granted by courts in the most extraordinary of circumstances. Section 213, unfortunately, has made it common procedure, as the data show, which is exactly what opponents of the PATRIOT Act warned would happen. The standard has been significant weakened, and an increasing number of individuals who fall subject to delayed notification warrants are being denied the opportunity to assert their Fourth Amendment rights.